I was not aware of this until it showed up on Digg this morning. 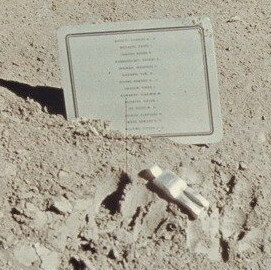 In 1971, Fallen Astronaut was placed on the Moon by the crew of Apollo 15, along with a plaque bearing the names of eight American astronauts and six Soviet cosmonauts who died during spaceflights or training exercises. But that’s not the whole story, this was a particularly interesting spaceflight, with more than one scandal, this being considered one as NASA had not approved of it, there’s another scandal regarding “First Day Covers” from the same flight. Transcript of NASA News Release, (September 15, 1972), describing the origin of Fallen Astronaut and the subsequent controversy. And finally there is a profit motive. “In May 1972, Scott learned that Van Hoeydonck planned to make more replicas and sell them. Feeling that this would be a violation of the spirit of their agreement, Scott tried to persuade Van Hoeydonck to refrain, but was unsuccessful; 950 signed replicas went on sale for $750 apiece at the Waddell Gallery of New York. According to an interview with the artist in Belgian newspaper De Morgen, this isn’t quite true. The statue was supposed to be a representation of mankind. Afterwards it became apparent the astronauts had turned the statue into a monument for fallen astronauts and cosmonauts. NASA had not told the gallery owner or the artist that the statue was going to be a grave monument. Van Hoeydonck’s gallery owner had planned a multiple of 1000 copies of the statue (he had spent a considerable amount of money getting the project realized), but after the public outcry only 20 copies were made, most of which went to museums.” Via Wikipedia. But there is Art on the Moon!